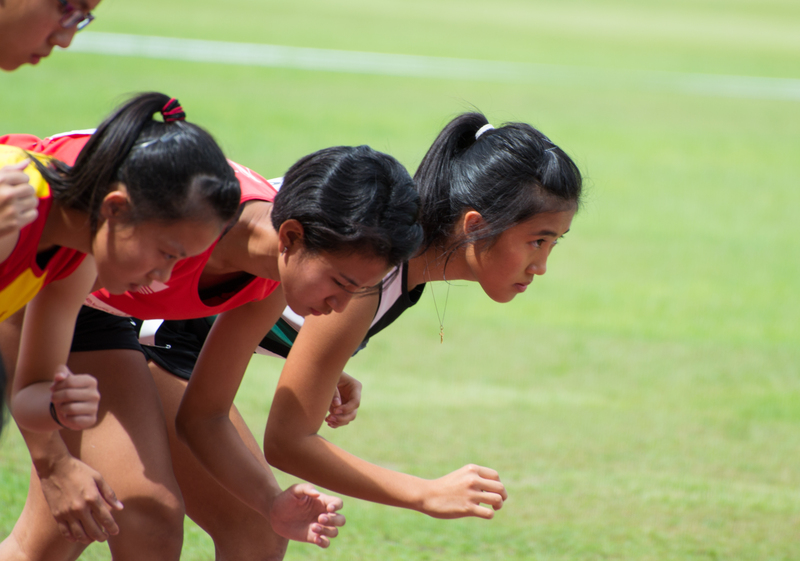 “On your marks…” A sudden silence falls over the Choa Chu Kang stadium as the runners crouch in the starting blocks, the yellow flags of the officials shoot up in unison, and the spectators fixate their gaze in eager anticipation. The only audible noises are the vehicles travelling on the nearby highway. The gunshot pierces the tense atmosphere, quickly followed by lung-bursting shouting and fervent clapping that pervades the stands. The hordes of supporters decked out in the myriad of school colours facing the imposing banners opposite is the very symbol of the National Track & Field Inter-School Championships. 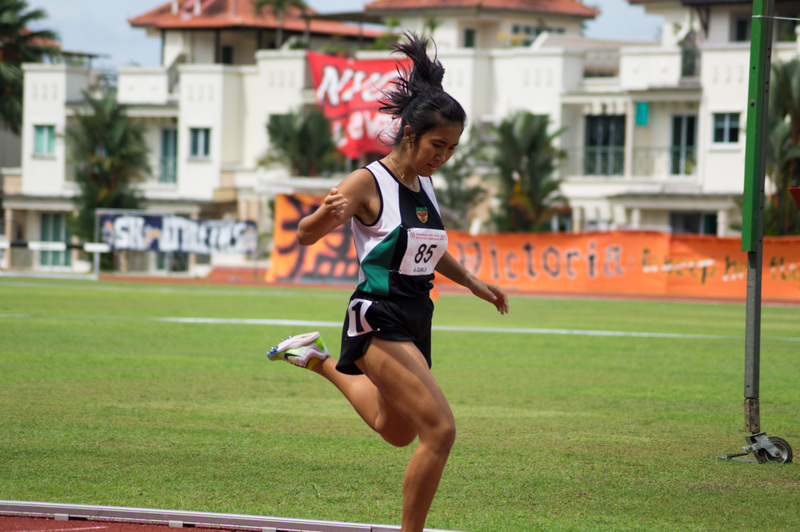 The first event of note was the A Girls 100m, which saw three RI representatives in Jannah Wong, Joy Chia and Rachel Koh, all of whom were strong contenders for a podium finish but facing stiff competition such as HCI’s Lynette Goh, the fastest qualifier. Running in lane 4, Lynette pipped Jannah to the line and Rachel rounded off the podium with Joy coming in 5th, achieving a 2-3-5 finish. Next, the A Boys took to the century sprint. Focus was etched on Ezra Toh’s face, our only representative in the final, as he stared down the home straight. His main competitor was V S Mohammed Jawhardeen, a secondary 5 student from Ahmad Ibrahim Secondary School, who had edged him out in the 200m final a few days earlier. This time, Ezra was quickly out of the blocks and after about 30-40m, he matched Jawhardeen stride for stride. However, Jawhardeen’s longer legs proved decisive as his superior stride length with every increasing step saw him pull away and finish in a very fast time of 10.79. Ezra followed closely behind in 10.99, a personal best. Next, the A Boys took to the track, with Justin John Surin, Heng Yu Jie and Joshua Nga aiming to complete the 3¾ rounds faster than the rest. The race ended up tactical, with no one willing to take the lead: Yu Jie set the pace from the start and led for the full first 1100m with Justin matching him stride for stride, but the pace gradually slowed, before suddenly increasing again as the bell rung to indicate the last 400m. 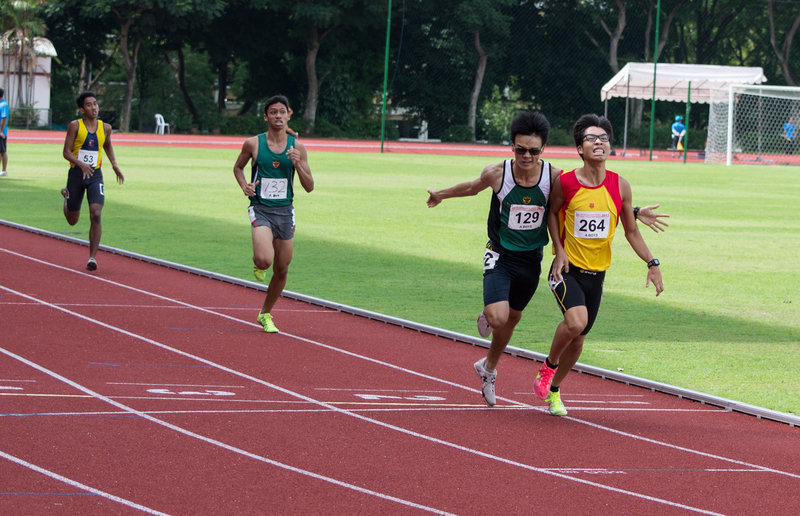 The 800m champion, Benjamin Tang of HCI, had gradually made his way up the field to join Justin and Yu Jie at the front, with the slow pace allowing quite a few runners to stick dangerously close. However, at 250m, the three runners in front sped up to attack the final bend, with Benjamin taking off first, followed closely by Yu Jie and Justin. Heading into the home straight, Benjamin was struggling to hold on and Yu Jie was fast closing on him, although the remaining 80m appeared slightly too short a distance to catch up. Yet, Yu Jie did a scorching last sprint and nearly edged out Benjamin, only to nudge him across the finish line first, unfortunately losing out by 0.01 seconds, having completed the last 200m in 27 seconds. Finally, it was time for the most eagerly anticipated events of the Track & Field finals every year – the relays, where RI was expected to do well with many of the top runners. Before the A Division races, the C Division Boys had served up a nail-biting finish neck to neck with the Sports School runner. Despite being nearly a head shorter, RI’s representative outsprinted his taller opponent to secure the gold in truly inspiring form. Perhaps this would serve as a springboard for later RI successes, and sure enough, RI swept the 4x100m for both A Boys and A Girls virtually unopposed as they finished with huge leads and well clear of their competitors. In the 4x400m, RI were strong contenders as well despite several runners suffering injuries. In the A Girls race, they came very close and Jannah was locked in a battle with the HCI runner throughout the anchor leg. They ran virtually side by side before HCI managed to open a slight gap on the home straight to take the gold. And the A Boys, despite missing key runners, put up a strong fight and led from the start, holding their own and fighting to the very end with Fanghua anchoring them home to a bronze medal finish. All in all, the A Girls demolished the other schools to storm to the title by a whopping 71 points difference from runners-up HCI, rounding off a ruthlessly dominant performance by the RI girls. 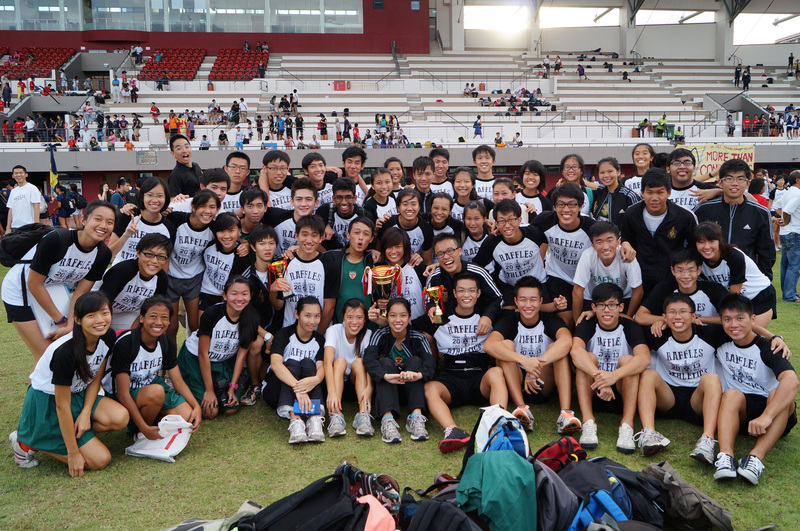 For the A Boys, we eventually lost narrowly by 30 points, also to HCI, despite a good showing by the boys. He also paid tribute to the various athletes who had contributed to the cause despite suffering from numerous injuries and setbacks, and as he put it, “We fought hard for every point despite the bleak circumstances”. For the boys, Eric Yun pulled his hamstring just 2 weeks before Nationals but still fought to run the 110m Hurdles and place 7th. For the girls, Elisa Djuhar deserves special mention — she had broken her ankle 2 months before, but persevered to recover well enough to run in the 800m finals on the final day, a true testament to the grit and tenacity that RI Track & Field embodies. From mouth-watering, crispy fried bananas to richly flavoured prawn soup, Longhouse Food Centre was a treat for the taste buds as it offered a variety of traditional Singapore hawker style foods. For our journalists, enough was enough – the trips to air-conditioned, fast-food eateries in Junction 8 have just been one too many.